Hmm. OK. So we may not actually have 1001 uses in mind. BUT. This product is just so very incredibly useful. No: Mr. and Mrs. Shopkeeper don’t have shares in chillies, pickled or otherwise. They also rock in salads. You can just drop them into your salad bowl, but we blend them into the dressing. 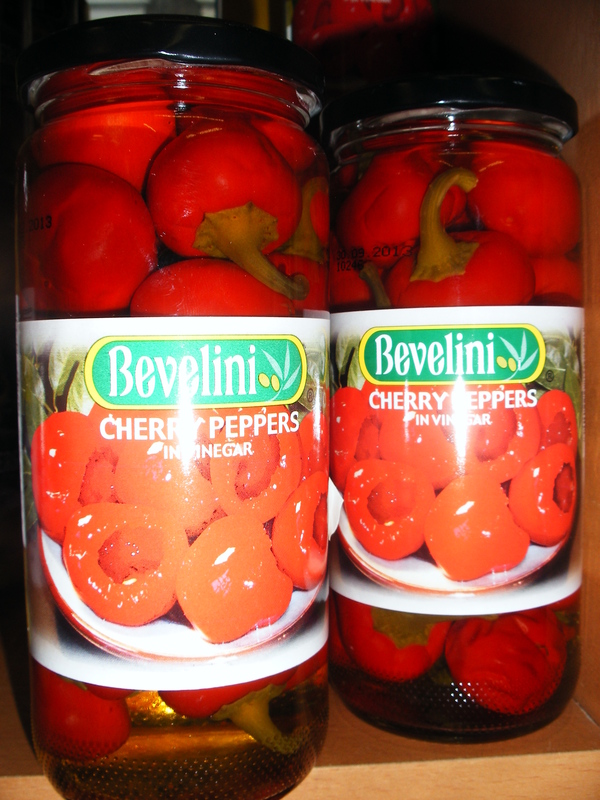 Finely chop 2 cloves of garlic, 2-3 sundried tomatoes, a dessert spoonful of capers and half a dozen cherry peppers. Pour about 150ml of olive oil into a bowl, together with 2 tablespoons balsamic vinegar and add the chopped ingredients. Whisk well, adding salt and black pepper to taste. Drizzle over your salad of choice. Iceberg lettuce would be particularly good, as it seems to need help at the mo. AND you can bake the things: they are sensational dotted in amongst a tray of Mediterranean roasted vegetables. Or chicken. Or fish. Mrs. Shopkeeper used them with ‘great effect’ (Mr. Shopkeeper’s words) with roast cod loin last night. Drizzle your loins (if you see what we mean) with olive oil, season them and place them in an oven tray. Scatter a few peeled cloves of garlic into the tray along with a punnet of cherry tomatoes, half a jar of cherry peppers (drained, stalks removed) and some sprigs of thyme. Bake in a moderate oven for around 20 minutes. Nom nom nom. All of this is admittedly a fad. By next week we will have a new favourite ingredient, as we are very fickle. But in the meantime, we can’t get enough of them. And at 99p/jar, we suspect you will agree.